Craig Bjarnason spent two years part-time building his Rob Macks Panache Kayak (18'4" x 22.5" ) The hull is knotty Western red cedar covered with 6 oz fiberglass cloth and epoxy. The trim is made from local Manitoba poplar. 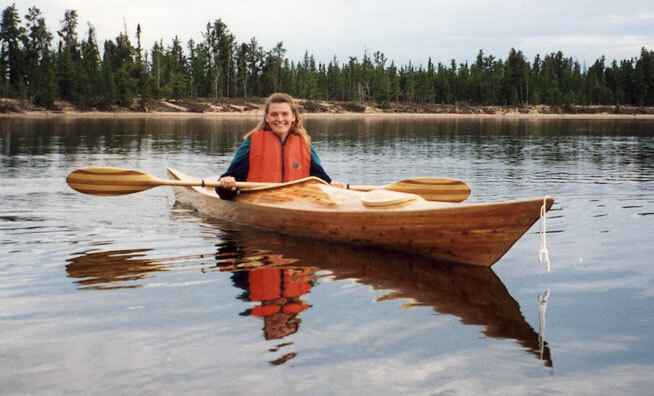 Craig drove 17 hours from his home in Winnipeg, Manitoba to his sister's home on Courtney Lake, Saskatchewan to launch his kayak on May 20, 2001. He took this picture of his sister on that day. Reach Craig at cbjarnason@shaw.ca.